Matt asked me the other day what my favorite vegetable is. Uh, PANIC! And are we counting tomatoes and avocados here? I seriously couldn’t answer, there are far too many magnificent vegetables out there to choose from. Nothing can beat a vine ripened tomato during the summer time, or some sweet roasted squash in the fall, what about the gorgeous deep purple of beetroot during winter months, or the simple beauty of a pink and white radish come spring? How can anyone pick a favorite? Poor guy, I bet he thought that was an easy question, and didn’t need a 20 minute rant on how amazing vegetables are. So, I don’t know what my #1 would be, but I definitely know that eggplant is high up on the list. I am a big fan of za’atar, I love the zesty taste of sumac with the nutty crunch of sesame seeds. It is great sprinkled of pretty much anything; hummus, pita, roasted carrots, yogurt. Eggplant and za’atar is one of my favorite combinations, and even better when cooked outside on the grill! Piled high on top of lentil salad loaded with fresh green herbs, here is a simple dish giving vegetables the glory they deserve! Can you pick a favorite? A fresh, summery salad that combines soft grilled eggplants and lots of fresh herbs. Cold leftovers make great pita fillings with hummus and extra greens. Serves 4, or more as a side. Vegan + Gluten Free. You can buy za’atar spice blend in specialty or middle eastern grocery stores, but I prefer to make my own. The recipe below is one that I make here at home, but feel free to play around with the quantities to create a home blend that you love. Slice the eggplant into rounds, place in a colander and sprinkle generously with sea salt. Set aside for 30 minutes, or up to an hour, flipping over every now and then. Rinse and drain the lentils, and place in a large pot with 4 cups of water. Bring to boil, then reduce to a simmer for 20 minutes, until the lentils are cooked al dente. Don’t over cook, or you will have a mushy salad. Drain any excess water and rinse the lentils clean. Set aside. (If you are using a different type of lentil, cooking times will vary so just read the instructions). Preheat your bbq or grill pan to medium high heat, and lightly press the eggplant with kitchen towel to remove any excess water. Brush the sides generously with olive oil and sprinkle with za’atar. Place on a grill and flip after 5-7 minutes, then cook for another 5-7 minutes. Brush with extra olive oil if looking dry. Eggplant is done when the meaty center is soft and tender. To make the za’atar, combine all the ingredients in a bowl and mix well. Keep in an airtight jar in your pantry. Some people prefer to combine in a food processor or crush in a mortar and pestle, but I prefer to keep things as in, I love the look of it sprinkled over the grilled vegetables. Oregano can also be added to the mix. So there are some options, up to you! Toss the cooked, cooled lentils with all the herbs, sultanas and toasted pine nuts. Season with salt and pepper and dress with a little olive oil and fresh lemon juice. Za’atar is one of my favorite spice blends. I bet it is wonderful on the eggplant. 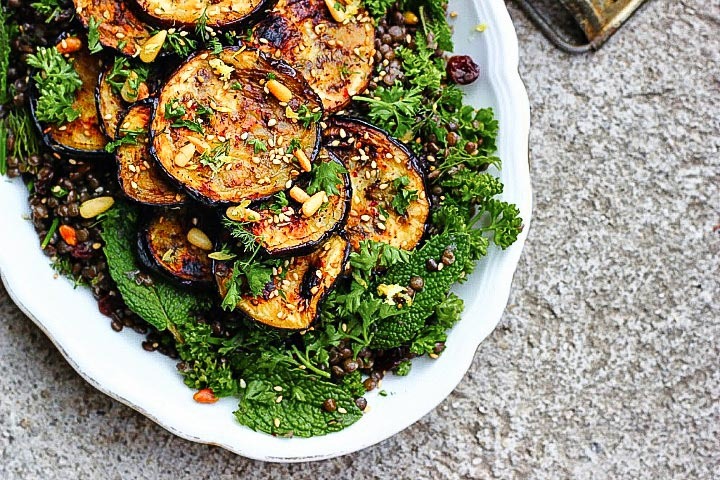 We love za’ atar but have never used on eggplant, this is a gorgeous looking dish. Love it! Love everything about this. The eggplant, lentils, zaatar… it’s all so perfect. Beautiful salad and beautiful photography. Just discovered your blog and am now pinning away! So many lovely salad recipes. Can’t wait to try some of them! Hey there, I had seen this recipe at One Green Planet a few weeks ago and bookmarked it to try later. I have just made it and had it for lunch, and oh my goodness! was this good!! Such lovely combinations. Thank you so much for the recipe, I shall go explore all the others in the blog. What I have seen so far looks divine! Thank you!